I remember the old food court here was dark and had old tables and dated fixtures. There was a place serving pizza by the slice, another sold chicken, then there was a gyro spot. 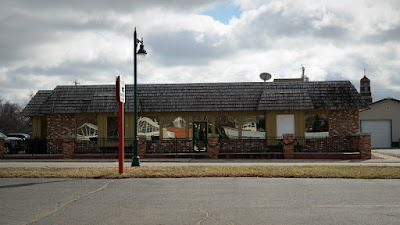 After the fire next door damaged this building, the area was renovated and reopened as Local Bites Food Court. The organizers went out of their way to find local vendors with new products that weren't already available in the skywalk area. Location: 700 Locust St in the Local Bites food court below ground level. Directions: You have to park in a ramp and take the skywalk to the Partnership Building then go down the stairs to the basement food court. The Tenderloin: This sandwich looked good from the outside with the pork loin overwhelming the little burger bun. The meat was pounded into a thin layer which could not hold any moisture. 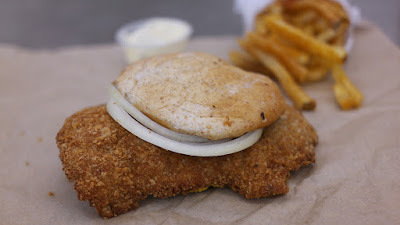 The texture of the breading had a good crunch, and had a little bit of salt or seasoning. Served on a soft whole grain bun with lettuce, onion, pickle, and ketchup. Overall 7.2 out of ten. 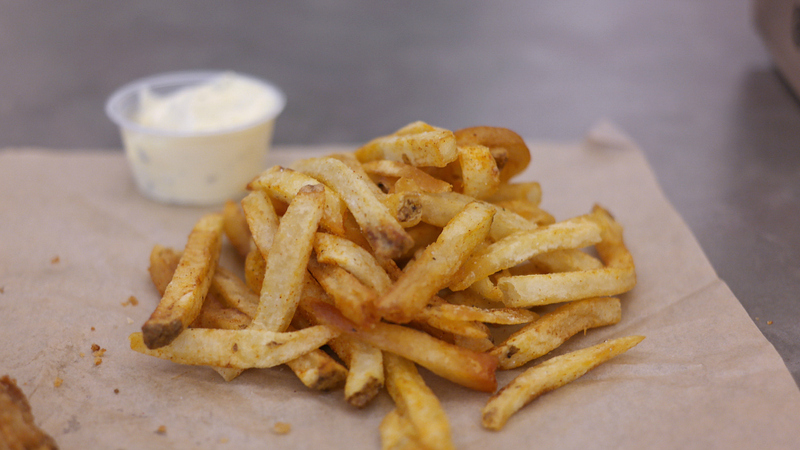 Farm Fries with dipping sauce. 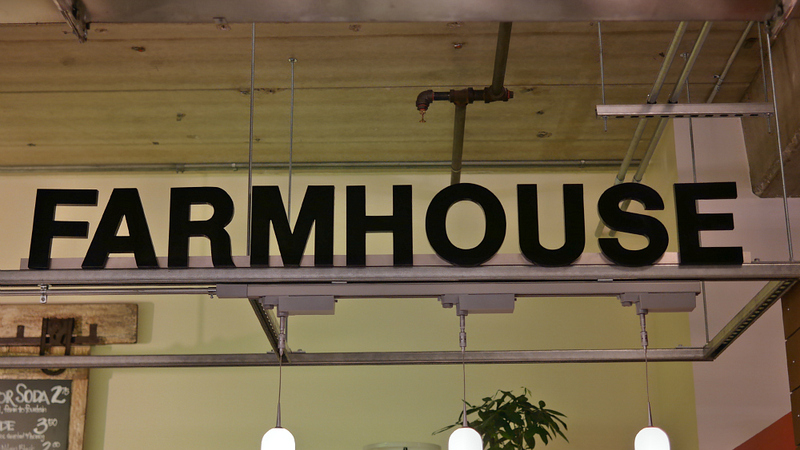 Also on the menu: their specialty is the Farm Burger, and the rest of the menu changes. 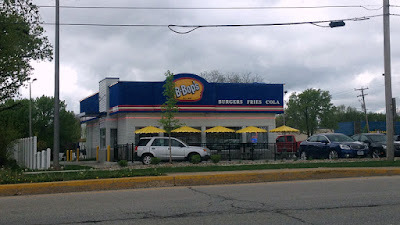 When I stopped in they had a lamb burger or a fried chicken sandwich. Service: One person was taking orders while another was working the kitchen, and it was going a little slow during the lunch rush. I really don't like they way they stick everything into a brown paper bag. Ambiance: This is a food court renovated and rebranded as Local Bites and opened this year with new vendors and long public tables. 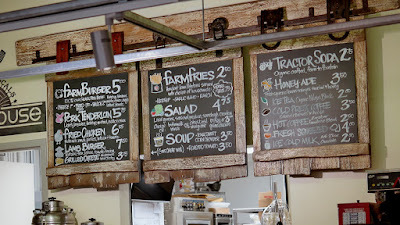 Local Yocals designed their stall to resemble a farm house kitchen with a shelf stocked with cook books and reclaimed barn wood holding up the menu. Final Thoughts: I had visited Local Yocals at their farmers market stalls in the past and their burgers or hot dogs were always good. This is a vendor that goes out of its way to use words like "fresh", "local", "farm" or "Iowa" as often as they can on their menu. I wish their tenderloin was more memorable, and would recommend the farm burger to anyone trying this place for the first time. 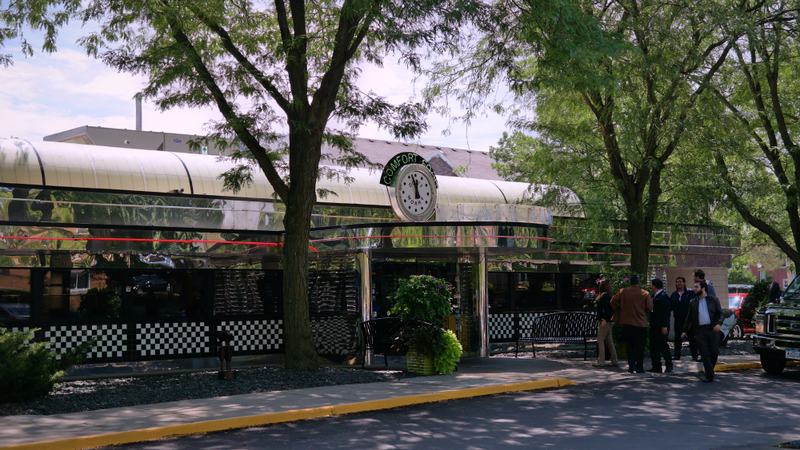 The Drake Diner has a reputation as a place where Drake students go to eat with their families when their parents come to town for a visit. The menu graphics reinforce the family appeal of this place. The Drake Diner has a good thing going with all these Drake students and guests from the hotel next door, the place is busy and probably gets more people than any other spot in the Drake neighborhood. Location: 1111 25th St near Drake University in Des Moines, Iowa. Directions: you turn south on 25th from University Ave while driving through the Drake neighborhood in Des Moines. 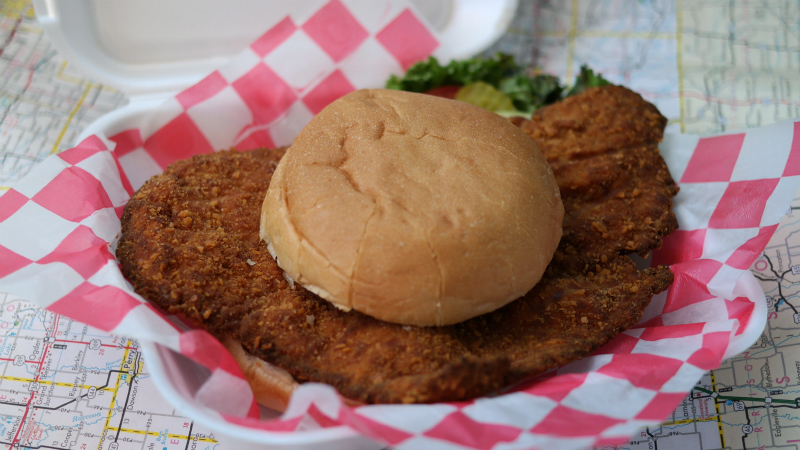 The Tenderloin: The tenderloin doesn't look big at first, and feels like just six or seven ounces compared to the bigger ones I've seen at other places. 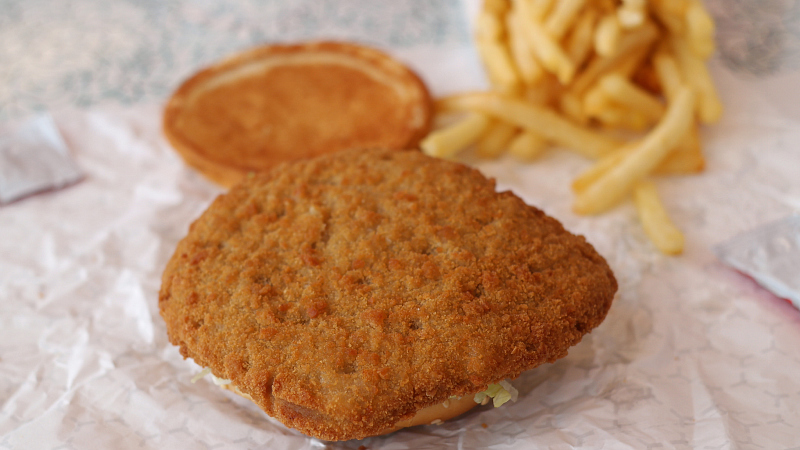 The breading has a great golden brown color and forms a fine thin layer but doesn't have much seasoning to it. The pork meat has a consistent texture like it was tenderized in a machine at the meat department, and the white pork loin meat was steamy and moist. This was an okay homemade tenderloin. 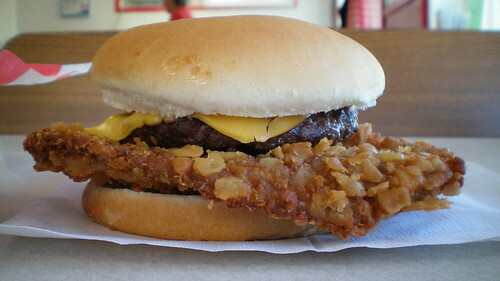 Served with onion and pickle on a big soft toasted bun. Overall 7.3 out of ten. 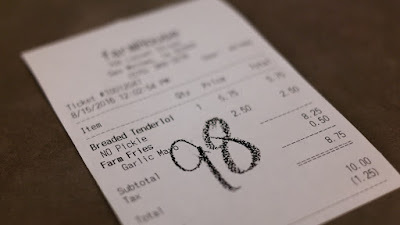 Price: $9.49 with a side of accordion fries. Also on the menu: They serve a lot of breakfasts with huge portions of eggs or pancakes or hash browns. Their lunch menu includes half pound burgers and other diner staples. 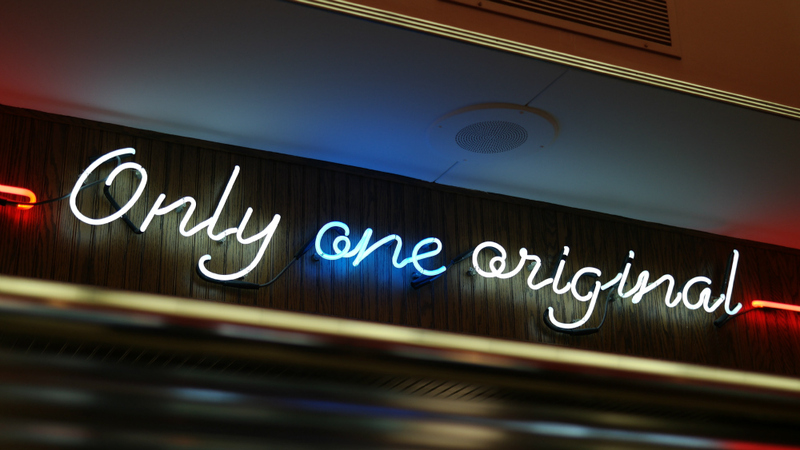 Local specialties include a rarebit burger served open faced and topped with melted cheese or a deep fried cheese frenchie sandwich. Then there is a big ice cream and dessert menu. Service: There is table service at the booths or counter service at the counter. Ambiance: I think the building was built to resemble a classic diner from the fifties, there is a large counter area and booths and a patio area for seating. There is a lot of neon lighting. Final Thoughts: This was a decent tenderloin at a diner famous for breakfasts and burgers. I still want to try the Rarebit burger sometime. I think I saw a plaque of recognition from the Iowa Cattlemen for their annual burger competition. I had driven past the Raceway Motor Sports Cafe a few times but then I noticed a banner reading "Biggest and Best Tenderloin in Town." 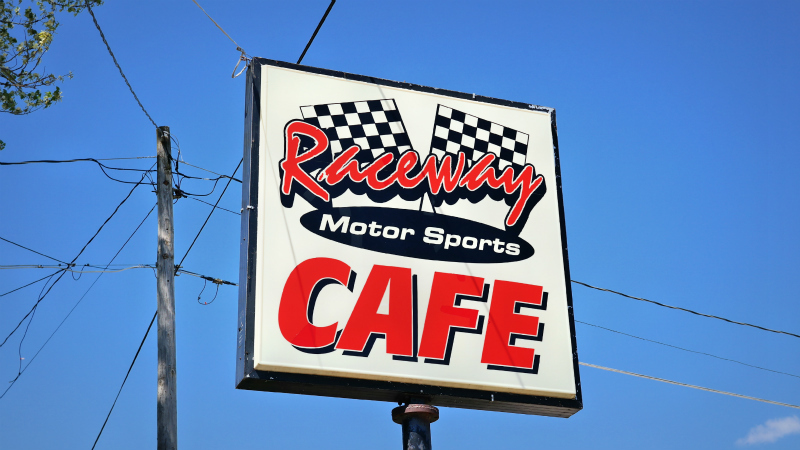 The racing themed sports bar has been open here since 2012 but hasn't been open on the previous times I've driven through on a Sunday or Monday. Location: 2331 1st Ave East in Newton, Jasper County, Central Iowa. Its about 35 minutes drive from Des Moines on I-80. Directions: You can take Main St east from downtown or take the exit from the race track and go north to Main St. 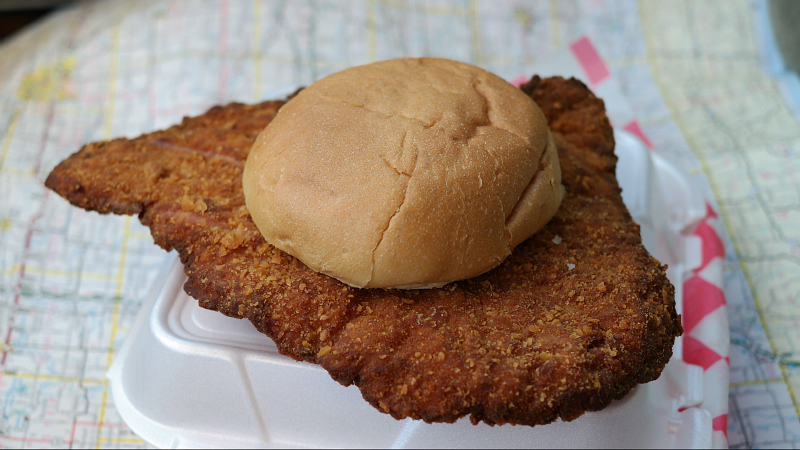 The Tenderloin: The first thing you notice here is the size. It feels like a good eight ounces pounded into a shape that doesn't quite fit into the to-go box. The very thin meat was dry on one half and only a little moist in the middle. 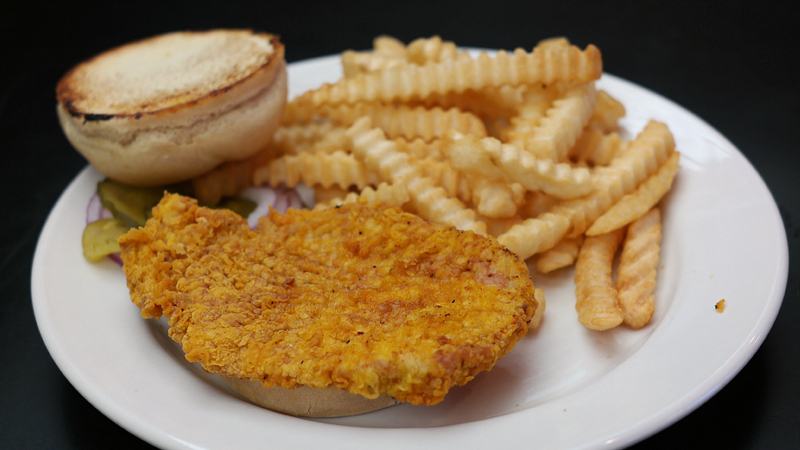 The breading formed a crunchy and crackerlike layer that had little or no seasoning. 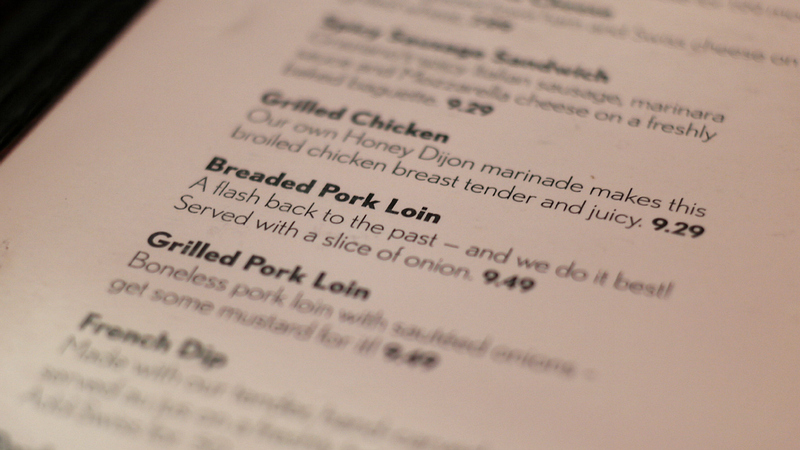 Served with your fixings on an untoasted bun. Overall 7.5 out of ten. 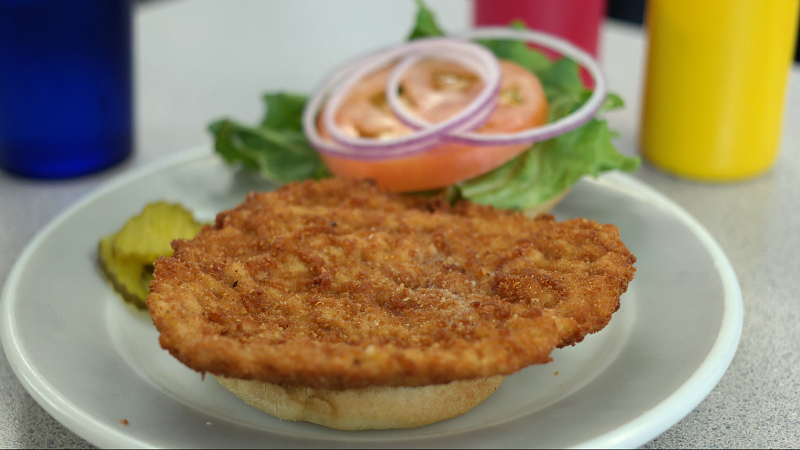 Also on the menu: There are burgers and bar foods like chicken wings, but also Italian dishes like pizza or grinders or daily specials. Service: I ordered take out from the bar but there is table service also. Ambiance: It was too dark to take pictures inside, but there is table and booths for seating, and a bar and patio when its warm outside. There is racing gear and beer signs on the walls and flatscreen televisions to watch sports. 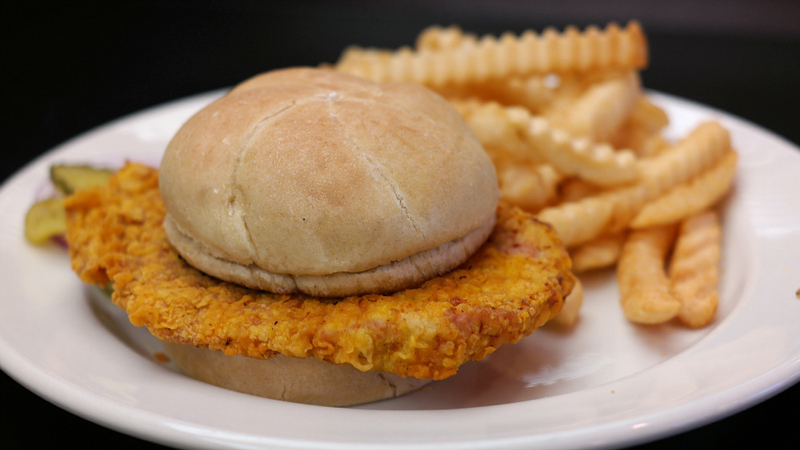 Final Thoughts: This is the second tenderloin that I have eaten in Newton this year after trying the Midtown Cafe in the center of town. 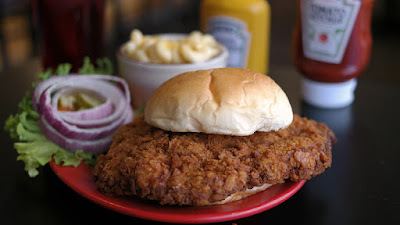 This tenderloin was better than the one at Midtown, but I am still looking for anything really exceptional in Newton and I haven't found it. B-Bop's Burgers is a local chain with locations in Des Moines, the suburbs and Ames Iowa. 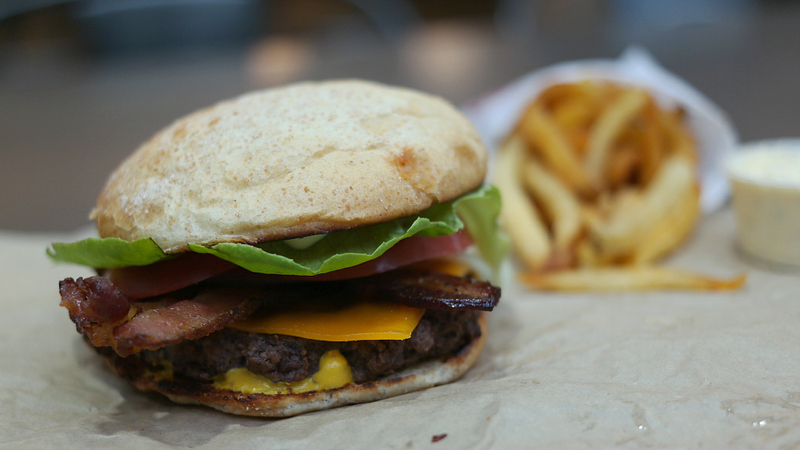 They frequently win "Best Burger" polls in Des Moines and the chain predates the gourmet burger fad that has brought so many new burger places with high prices to the market in the past ten years. Just last year B-Bops opened its first location with indoor seating and counter for ordering on the South Side of Des Moines. Location: 4500 Fleur Dr in the southwest side of Des Moines, Iowa. Directions: This is just a few blocks north of the Airport on Fleur Dr. 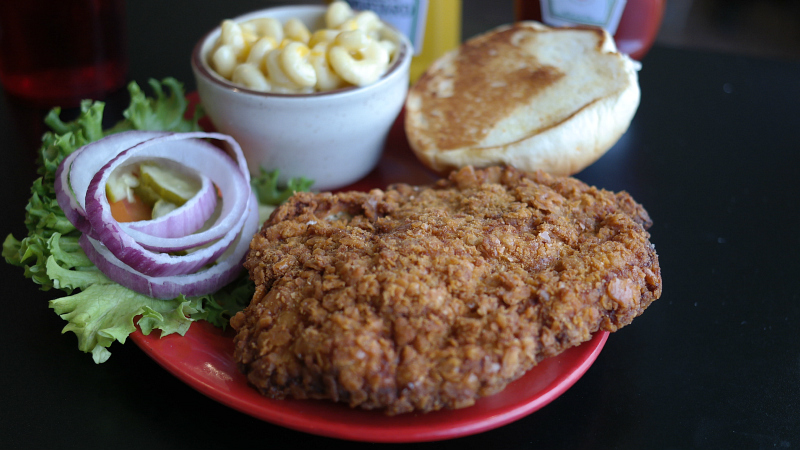 The Tenderloin: Described as "1/4 pound pork loin fritter". This had a layer of breading that was crunchy but also hard and flavorless. 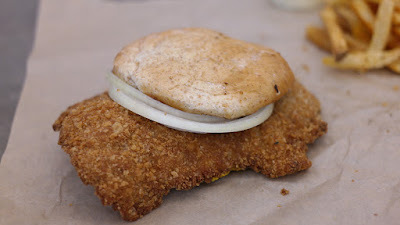 The tiny amount of soft meat inside was moist and grayish in color with the consistency of a sponge. 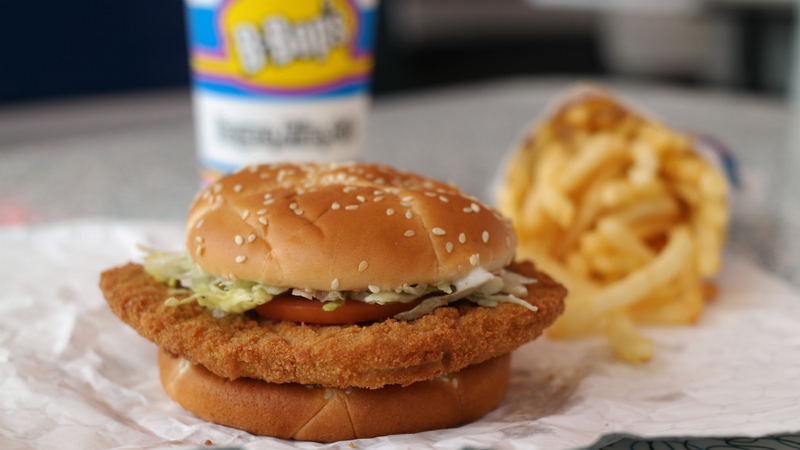 Served on a sesame seed bun topped with shredded lettuce and onions mixed with ketchup, mayonnaise and tiny pickle slices. Overall 2.0 out of ten. Price: I think the combo meal was $6.49 before tax but I didn't get the price of just the loin. I think its over three dollars by itself. Also on the menu: The burgers from through a broiler and the fries were fresh and hot, they have a big vat holding chili. Service: Its fast food counter service with your number called when your order is ready. Food is served in a paper bag even if you are eating inside, and you have to ask for ketchup. Ambiance: This is a new concept built in the past year as a dine-in B-Bops and the tables are new and clean and there is outside seating too. 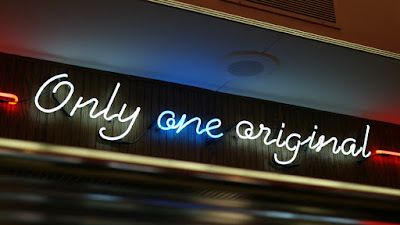 The oldies music and a few fixtures hint at a retro diner meeting modern fast food. 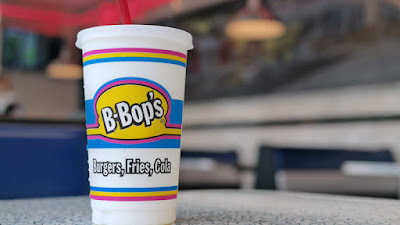 Final Thoughts: This tenderloin was awful, get the burgers or the chili when you stop at B Bops Burgers. Even the chicken sandwich is noticeably better than the pork loin served here. 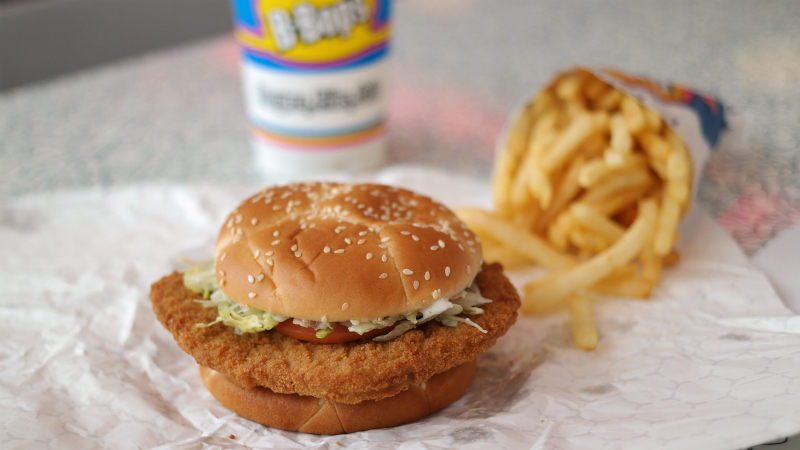 The interior was clean and bright, the fries were hot and crispy, but don't get the tenderloin. 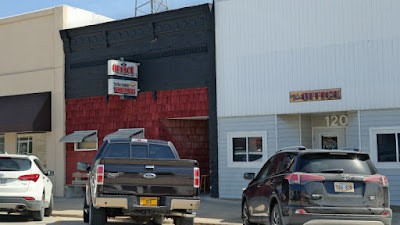 The Office is a small bar and restaurant on the main street of Lenox in Southwestern Iowa. 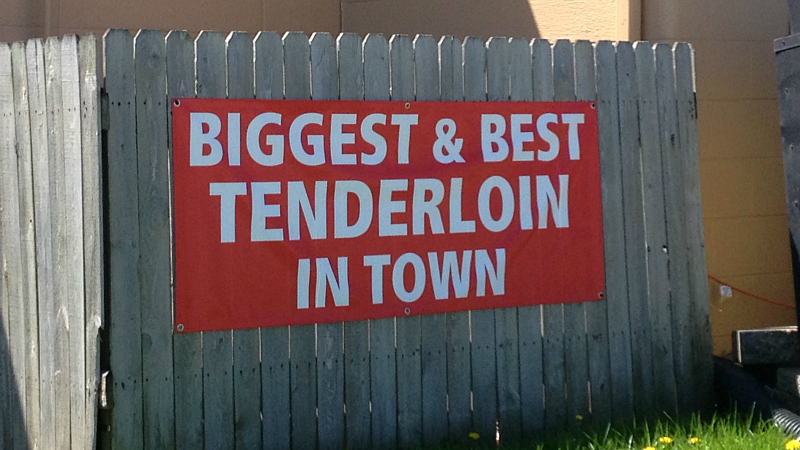 The sign says "Try our Famous Tenderloins", and the IPPA named them a finalist for last years Tenderloin award. 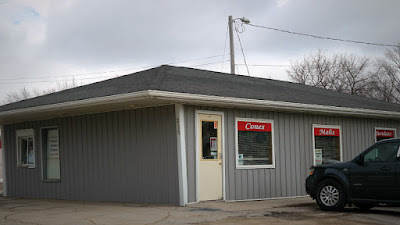 Location: 122 N. Main St in Lenox, Taylor County in Southwestern Iowa. 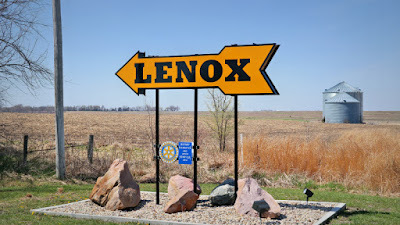 Directions: you take Highway 34 from Creston and turn south on the County Road with the big Lenox sign. The Tenderloin: The first thing you notice is that this thing is huge. Its at least ten ounces before breading and frying. The butterfly cut and pounding had turned this into two big thick portions of pork loin with a thin area in the middle. The thick parts were juicy and the thin areas dry. The breading had a lot of seasoning salt that left a taste in my mouth. The trimming job left some hunks of fat on the edge. 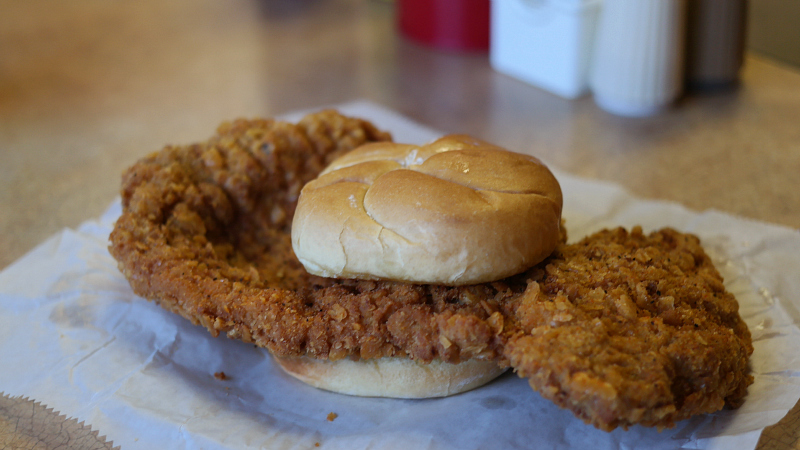 The overuse of the salt and the hunks of fat held this from being rated higher, its still a very good tenderloin. 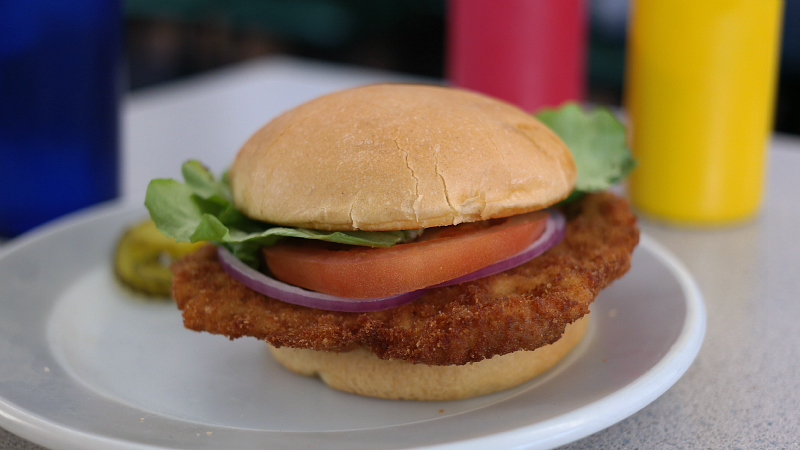 Served on a toasted flour dusted bun with your choice of fixings. Overall 8.5 out of ten. Price: $6.45 for a sandwich this big its like they are giving it away. 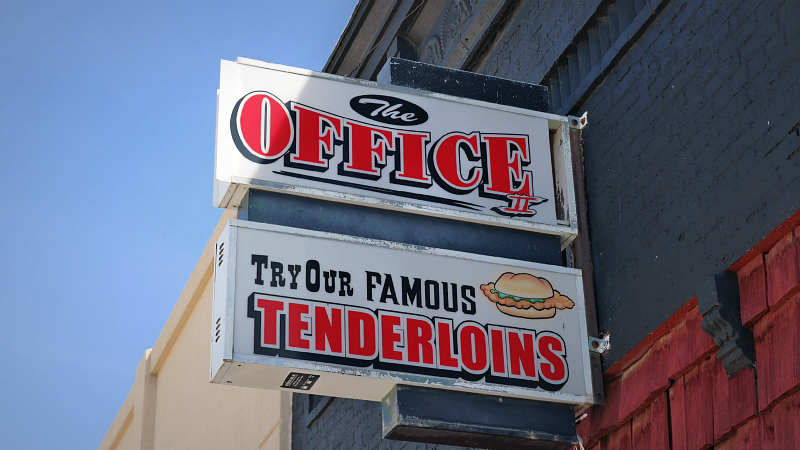 On the menu: the names have office themes like The Secretary and include burgers and steak dinners. Service: Its table service with one person serving all the tables when I was in. Ambiance: The layout is odd with two storefronts and you have to walk into the dining area then into the bar to get service. Final Thoughts: I hadn't eaten a super jumbo tenderloin as big as this in a while. The nearby Elm's Club in Creston is the local legend with the IPPA Tenderloin Award and recognition from the Iowa Beef Council for their burger. The Office in Lenox compares very well. I've been driving around Fort Dodge and surroundings for a long time now. I went to local legend Community Tap & Pizza and found an okay tenderloin, but I've kept looking. Now it seems like plenty of places have come and go over the years in the downtown area and the commercial strip. I hadn't heard of Sneakers Pub until a few months ago, and it looks like the building used to be a different restaurant. 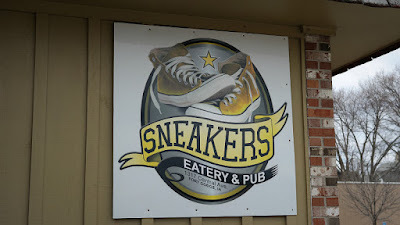 I still don't understand the appeal of naming a bar after a pair of shoes, or having shoes in the sign. 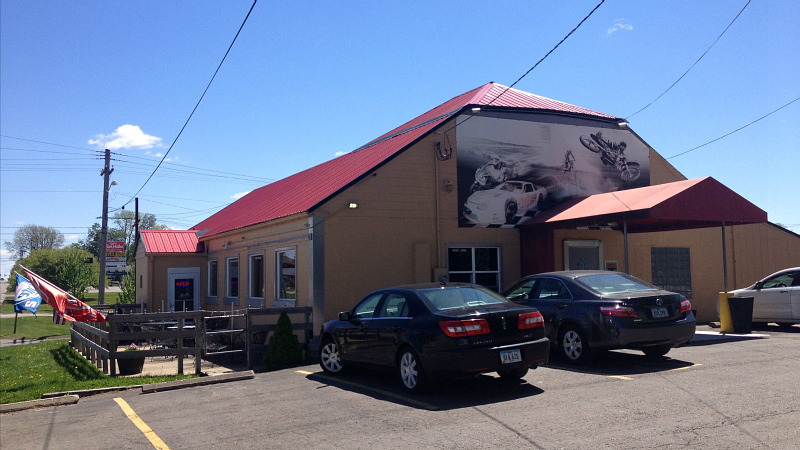 Location: 1317 Central Ave in Fort Dodge, North Central Iowa. Directions: Central Ave is just East of downtown Ft Dodge and can be reached by taking the Business 20 turn off and turning north on 12th St or 15th St. 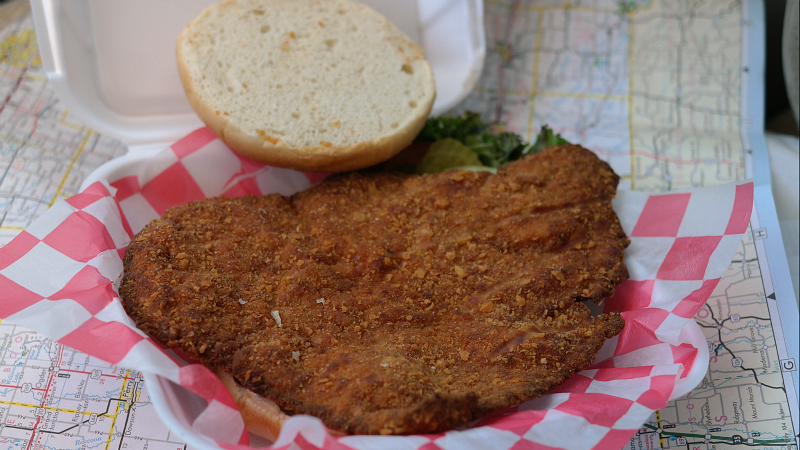 The Tenderloin: This was a large cut of pork loin, at least eight ounces. 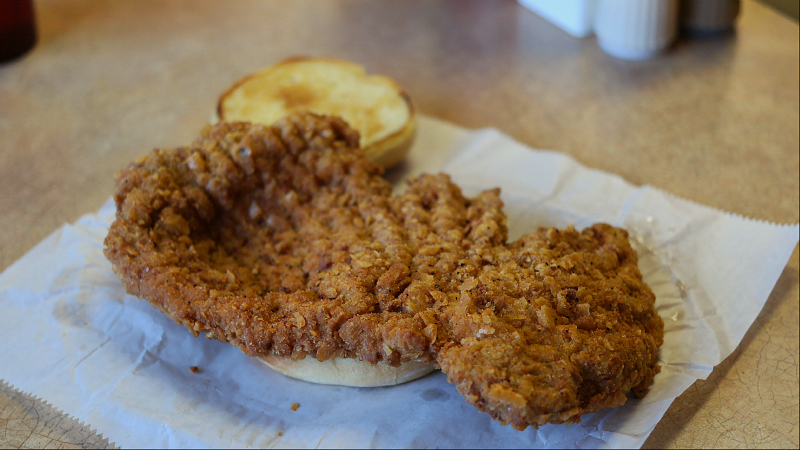 The breading formed big crunchy flakes on all parts of the meat. The pork loin was dry on the edges and soft and juicy in one part, but the fat hadn't been trimmed well. Served on a giant toasted bun. Overall 7.4 out of ten. Also on the menu: The menu is huge with burgers, wings, a "world famous rueben", fish, tacos and everything you've seen at sports bars before. Service: There was one server working the bar and dining areas who was a little overworked when I was in. Ambiance: This is a sports bar with a huge bar area and televisions and sports stuff tacked onto the walls. Final thoughts: Sneakers was a nice sports bar with an alright breaded tenderloin. 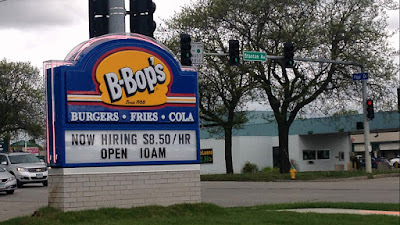 I haven't found a real good one in the city of Ft Dodge yet. 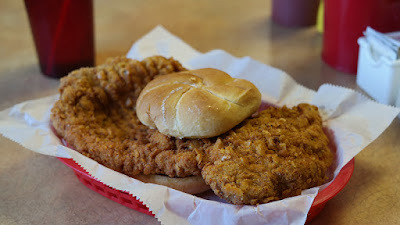 Just a short drive from Ft Dodge I have found good tenderloins in Clare or in Paton or Ogden. 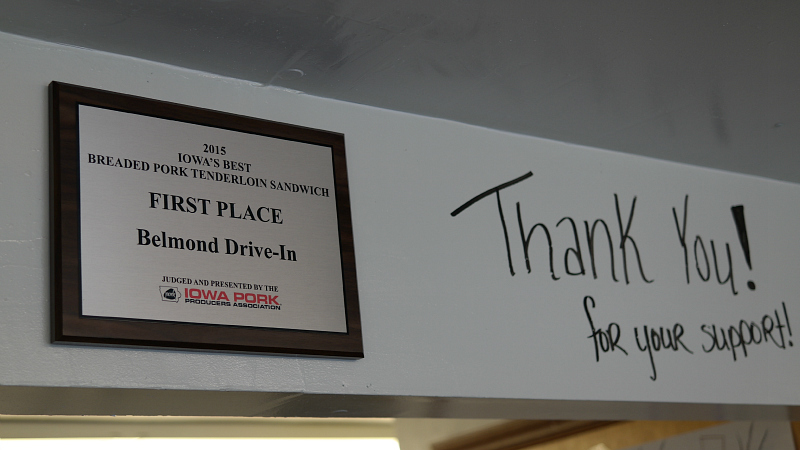 The Belmond Drive-In has a tenderloin on the sign, and its 2016 IPPA Best Tenderloin in Iowa Contest plaque on the wall. 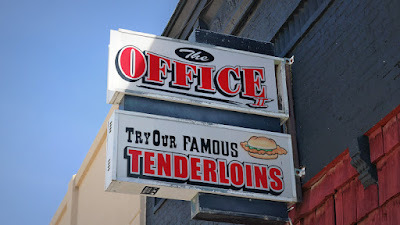 Then they have a sign reading Best Tenderloin in a window, and then the shirts they wear say "Hand Breaded Tenderloins" and "Full of Awesome". 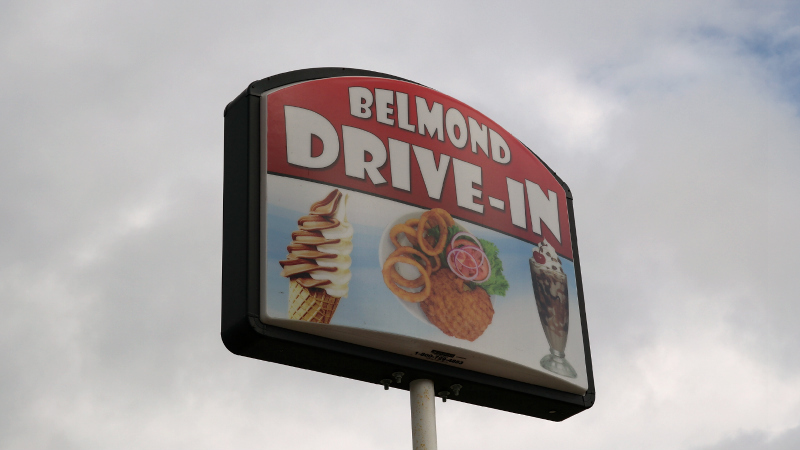 Location: 215 River Ave S in Belmond, Wright County, Northern Iowa. 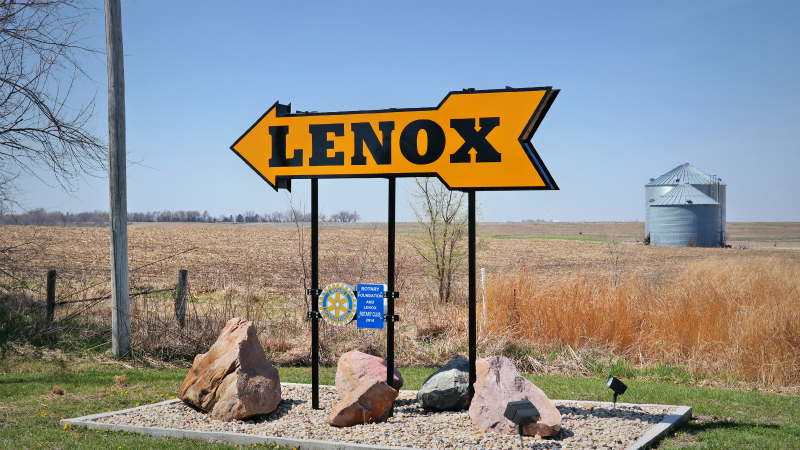 Directions: you take Highway 69 North from Des Moines past Webster City and this place is on the south side of town. Also on the menu: The menu has the basics of burgers, a melt sandwich, and hot beef with ice cream shop items for dessert. Service: There was one person working tables and one person cooking when I was in. Ambiance: The interior is covered with Belmond-Klemme Mustang gear, seating was available at a small counter or tables. Final Thoughts: This tenderloin is a case of good things sometimes coming in small packages. This is my first stop in Wright County, and I hope to get back in this area when the weather warms up and more places are open.